It took me a little while to realize that SS in Starbucksian jargon stands for Shift Supervisor, not Schutzstaffel. Over the years I got used to being asked for my SS (Social Security) number, but apparently when I hear “SS” in other contexts my first thought is still “Nazis!”. This reminded me of a rumor that I’ve heard before. 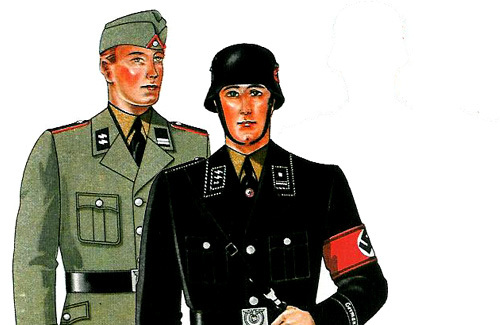 See, I’ve been told that that SS uniforms were so stylish because they were designed by Hugo Boss. It did not sound right – I thought that Hugo Boss is an American company, that was created after the war and that Hugo Boss is not a real person, but a created brand, like Mavis Beacon (see my post about that). The first place I went to was hugoboss.com. Well, I was wrong, it’s a German company all right. But the website is missing “Company history” section. Suspicious. I mean, usually established companies are rather proud of their beginnings. Kennethcole.com, for instance, has a whole segment about how Kenneth Cole (he’s a real person, I’ve even met him once) hacked New York City rules by pretending to shoot a movie in order to gain valuable parking permit necessary to sell shoes out of a trailer. You can read all about it here. So, I did a little digging of my own and guess what – according to Wikipedia, which in turn quotes Washington Post, Hugo Boss, the founder of the company did indeed design and manufacture Nazi uniforms, and on top of that likely used forced labour. Maybe Hugo Boss of today is very, very different from the WWII era one, but they do make some snappy clothes.